Lewistown, 1903, was a bustling and growing inland community. Utica’s sapphire mine was at its prime. Giltedge and Kendall were mining gold, and people were taking advantage of the free land offered by the government at the time. The population was approximately 4,000 and growing. The Catholic Church recognized the need to educate and care for the sick of the 24-year-old community. Preparations began to build the structure of St. Joseph’s Hospital. Nuns from France, members of the Order of the Daughters of Jesus, were brought in to make this a reality. Five years later the construction began. A report, ranging from 1903 to 1953 indicates the first unit was completed by Croatian immigrant, Pete Tuss. The longest of the five units that make up the massive historical building was built by John F. Plovanic in 1913. He was the Chief Stonemason on that project as well as on the third, fourth, and fifth units. Croatian stonemasonry dominates the structure, as it does for many other buildings in the community. This was imperative for the success of the project, as building materials were scarce in the area, and transportation was limited to stagecoach. A one and a half day ride would get you to the nearest town of Great Falls for supplies making a project of this size nearly impossible. The original masons quarried the stone locally during the summer, until the ground froze, and began again in the spring. During the winter months they would kiln the lime in what is known as Lime Kiln Canyon. The lime would then be used to plaster the stones together. Tens of thousands of tons of sandstone were quarried in the building of the hospital. The Montana Heritage Project reports that “master stonemasons from Bribir, Croatia decided to stake their fortunes and futures in Central Montana and became the founding fathers of Lewistown’s architecture, chiseling by hand enormous blocks of sandstone, mortaring them with native lime, and building magnificent structures which rivaled in style and grace those of their beloved Europe. The work was grueling, and the three men sent to Croatia for talented friends and family members to join them.” The census indicates there were approximately 100 Croatians living in Lewistown and 373 in Central Montana in 1908. Approximately 200 Croatian stone buildings were built between 1900 and 1920. Forty-three stand at this time. St. Leo’s the Great Catholic Church, established in 1888, originally stood on the corner of Miller and Watson Street, where the current structure stands now. It is now located on Broadway Street since 1916. A small house was built on the corner, also in sandstone, for the reverend. A small building structure sitting next to the church was utilized as the town’s hospital until St. Joseph’s was built. The cornerstone for the hospital was placed in early 1907. By fall 1908 the first patients were admitted. 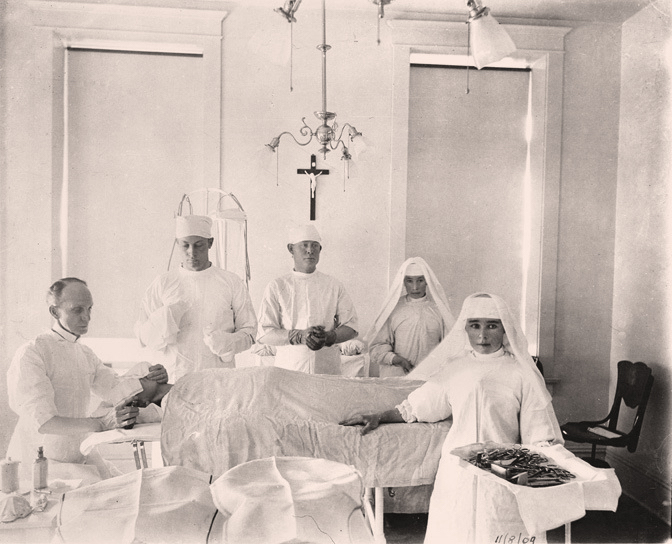 The first unit held thirty beds, two operating rooms, a sterilizing room, and a few small utility rooms. On the ground floor was the kitchen, heating plant, and laundry and sleeping rooms for the staff. In 1913 an addition was built making it possible for them to house 47 patients. They also added two large operating rooms. Shortly after, a room was added for physiotherapy and a laboratory. In 1919 the old building facing the hospital was renovated for the housing and training of the nursing school students. In 1920 the hospital was designated by the U.S. Government for rehabilitation of returned soldiers. A very high standard must be met to attain such a designation. As Lewistown grew so did the need to expand the maternity unit. In 1927 a complete and more modern unit was built (the building that faces Watson Street at the rear). Its addition brought the hospitals capacity up to 100 patients. The chapel was added in 1934 when an addition was built. This included transforming the operating room, lab, and x-ray into patient rooms. Larger rooms were built to accommodate the “specialty” quarters of the operating theater and x-ray lab. Concurrently, the nurses’ home was being built and readied for personnel and students by 1936. The hospital and nursing school remained viable until the hospital was closed in 1978. It sat dormant until the late ‘90s when construction began on its transformation into the Fountain Terrace Condominiums.